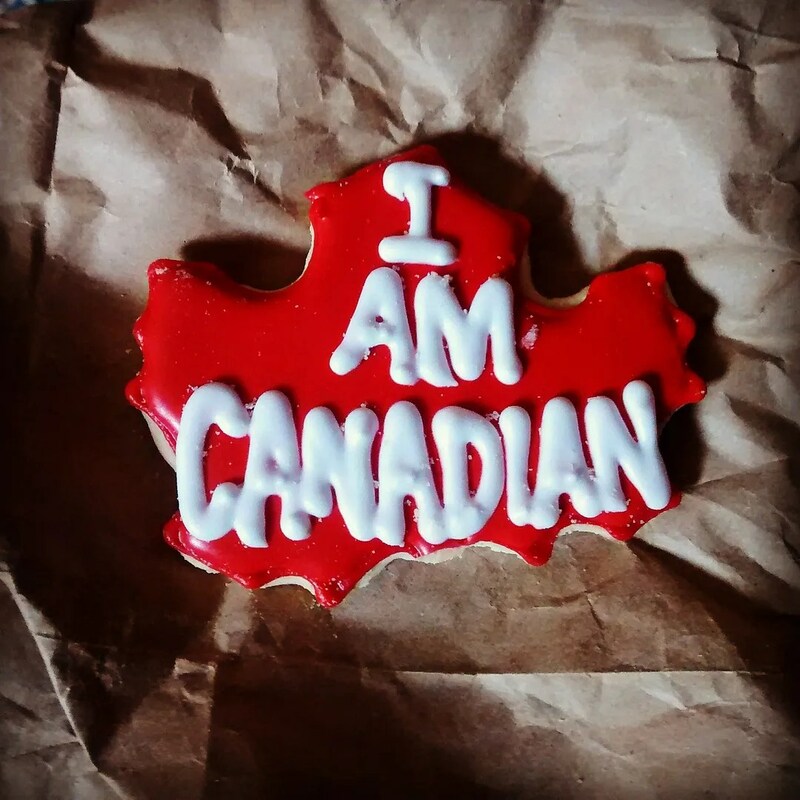 I liked this Canada cookie so much I bit off the stem of the maple leaf before I thought to take a photo of it. No Regrets. It’s been over a week since I’ve been back from Montreal and Ottawa. It took me a little longer to post than usual. And, in exchange you get a super long travelouge. Exciting, isn’t it? Before I made it back home to Baltimore from Canada, I had a detour to a fishing camp in the Catskills. My friend and pro photographer picked me up during my Philly layover so I could be her photo assistant at a western New York wedding for the 4th of July. I was more than happy to help as it kind of extended my vacation and let me feel like I knew what I was doing with a camera. The wedding was also pretty incredible. I cried during the vows and toasts and I don’t even know these people!! 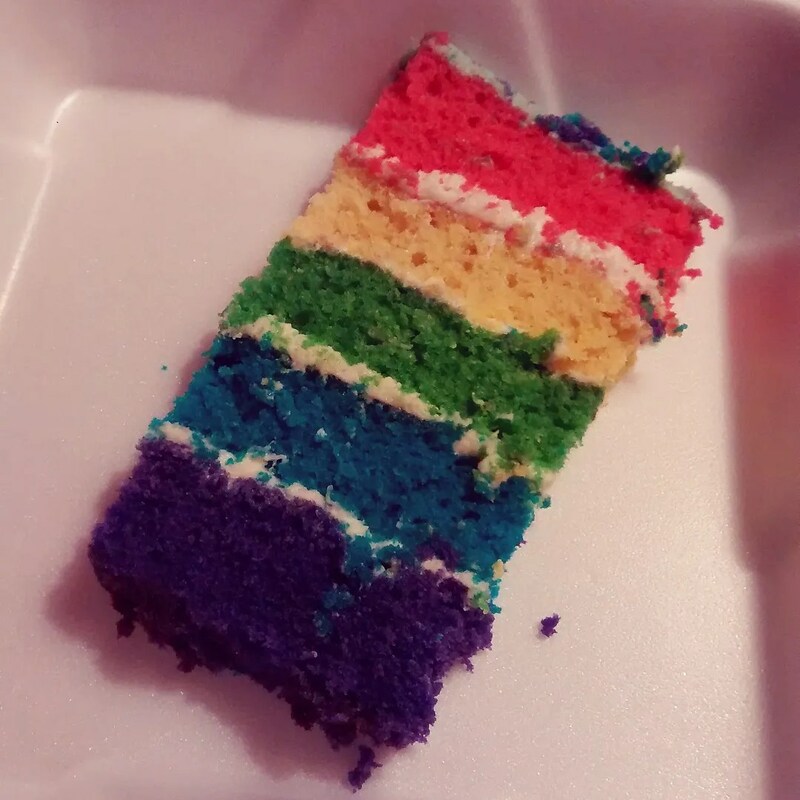 The wedding cake was rainbow layers. Something I’ve seen pop up on Pinterest and Instagram and I was DYING to actually try one. It was just as delicious as it looked. When my friend posts photos from the wedding online, I’ll link back so you can see. It was a gorgeous riverside ceremony with a party that went until 1:30 a.m.
Our very old school motel had a minty green bathroom and Gideon Bibles in the bedside table. I swear I haven’t seen those in 20 years. These were published in ’73. 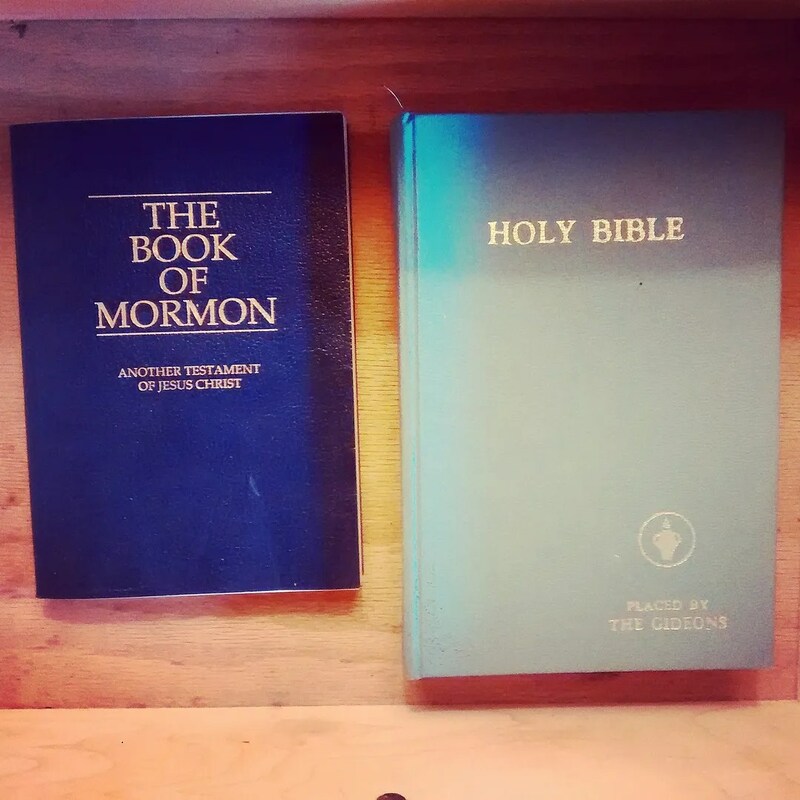 And, I for sure haven’t ever seen a Book of Mormon in a hotel. Once back from ten days of not being at home (or work) I just needed a bit to get myself (and laundry washed) together. 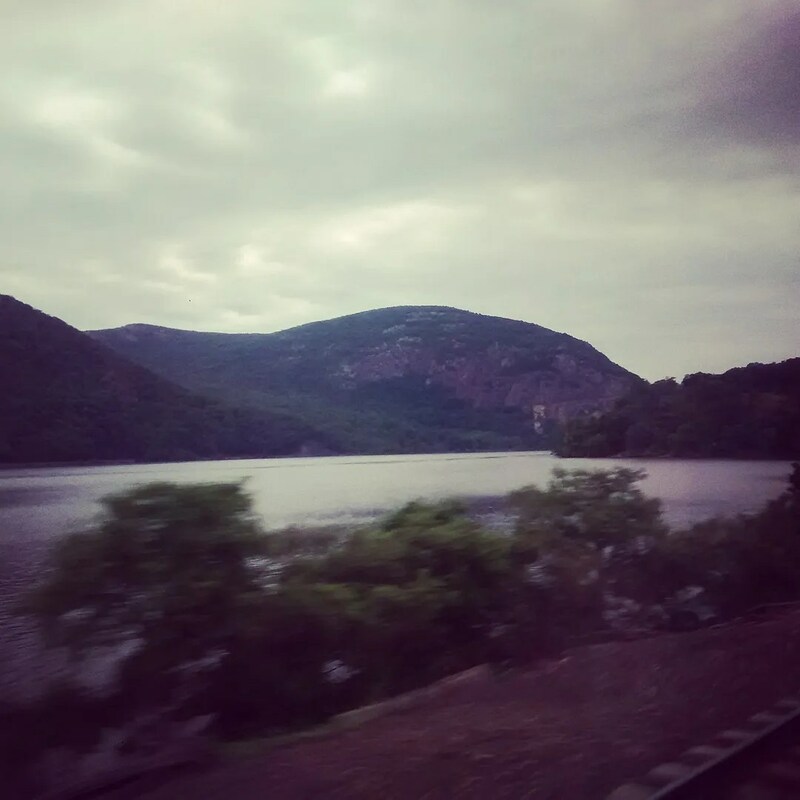 We took the train to Canada from Baltimore at an unbearably early hour. But, as I’m a champion sleeper in moving vehicles, it didn’t bother me. 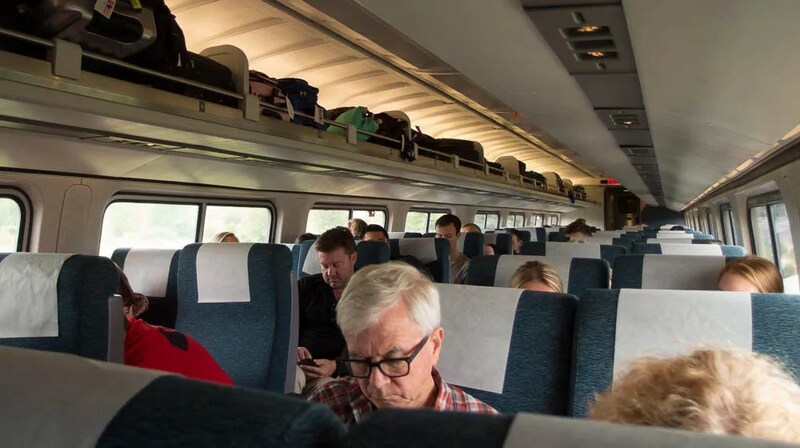 The train is four times as long as flying but 1,000 times more comfortable and scenic. 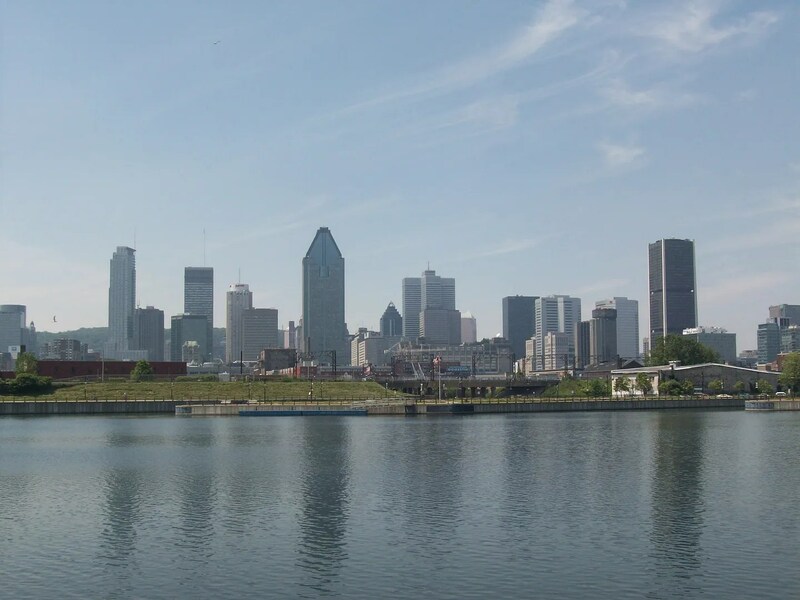 Our first stop was Montreal which I FREAKING LOVE. 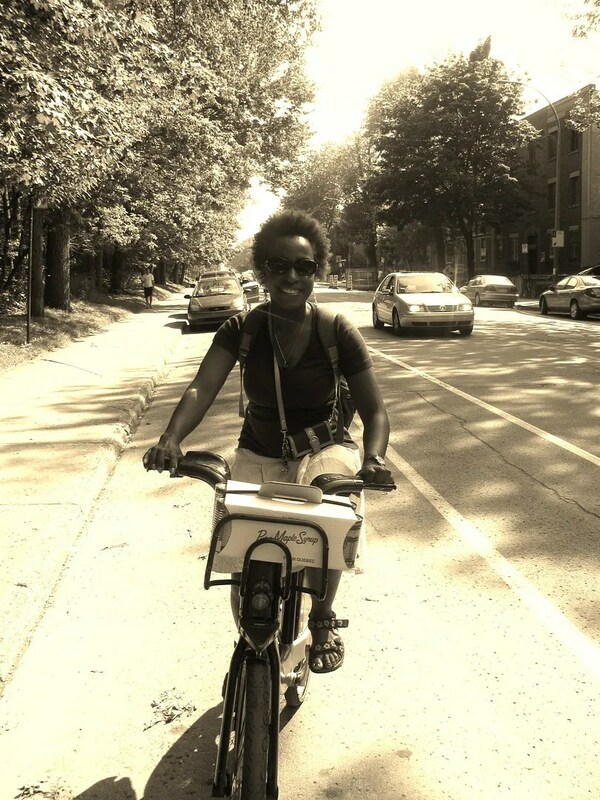 As per usual, we took a bike tour through the city. 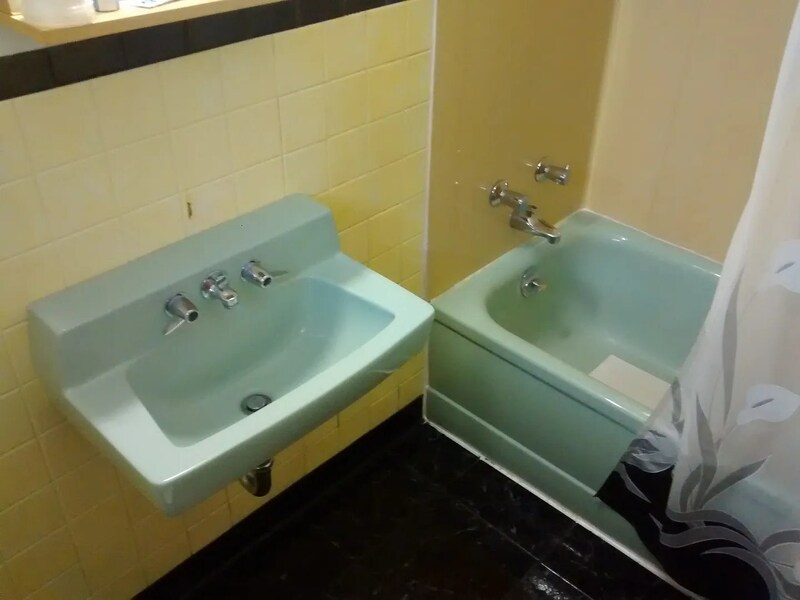 We used the same company that Trena and I used five years ago, Fitz & Folwell. And, let me say this, the owner Shay stay fine (apparently I referred to him as ‘smoking’ the first time). 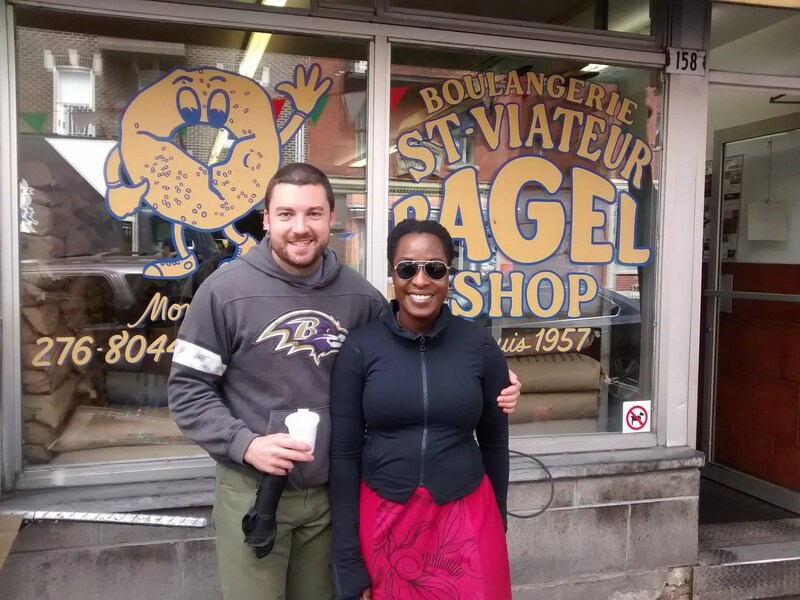 I was much more food touristy on this program with visits for both Montreal bagel standards. I was all set to ignore the bagels but glad I complied with Instagram suggestions. 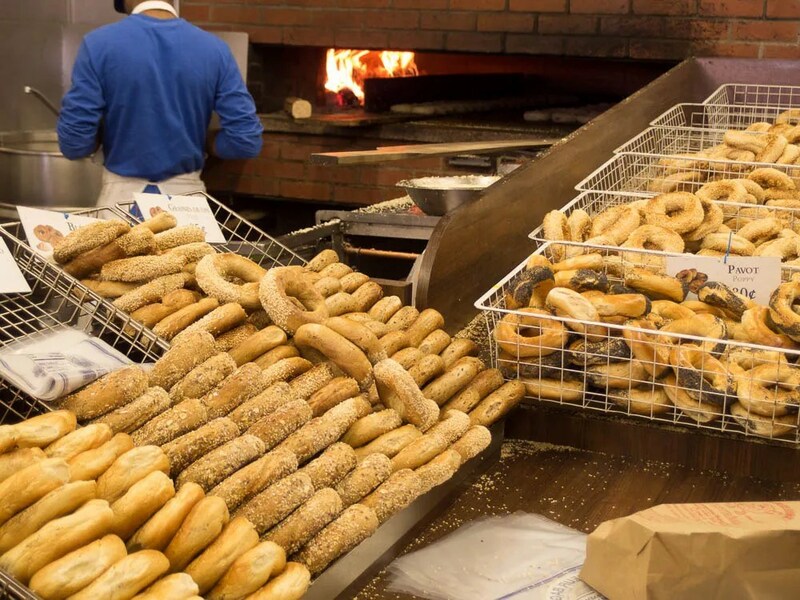 They actually are different than NY bagels. And super good hot and fresh from the oven. But, I have to give it to St Viatauer for the win. I generally don’t believe in waiting in line for food. 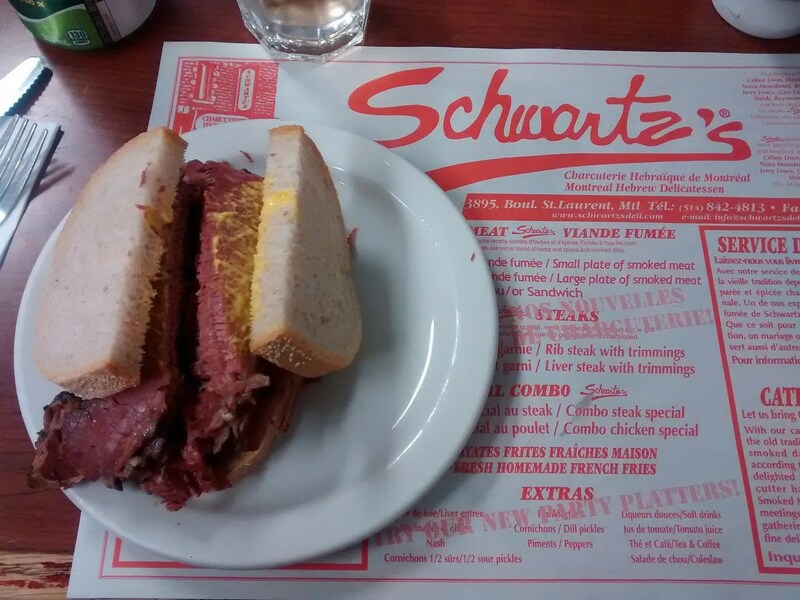 But, we did for Schwartz’s smoked meat and again, phenomenal. 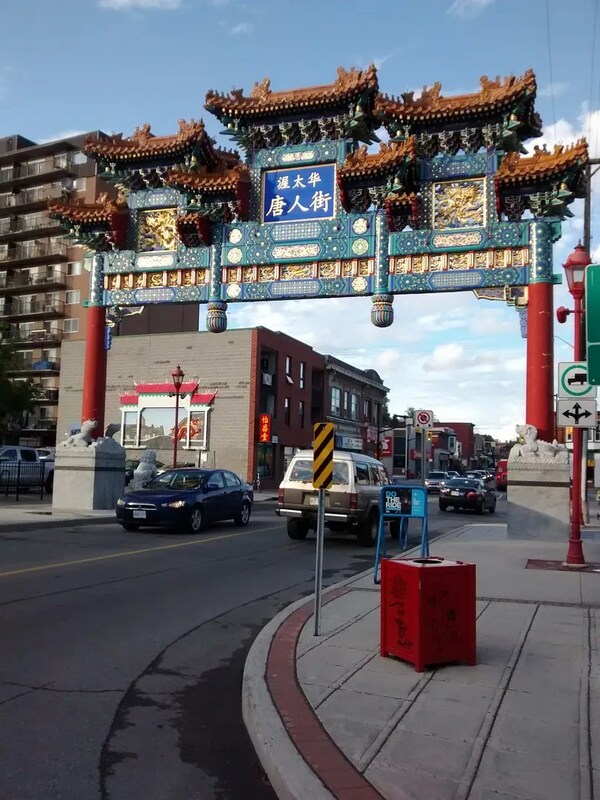 We also took a walking tour of the Jewish Quarter organized by the Montreal Jewish Museum. Totally fascinating. 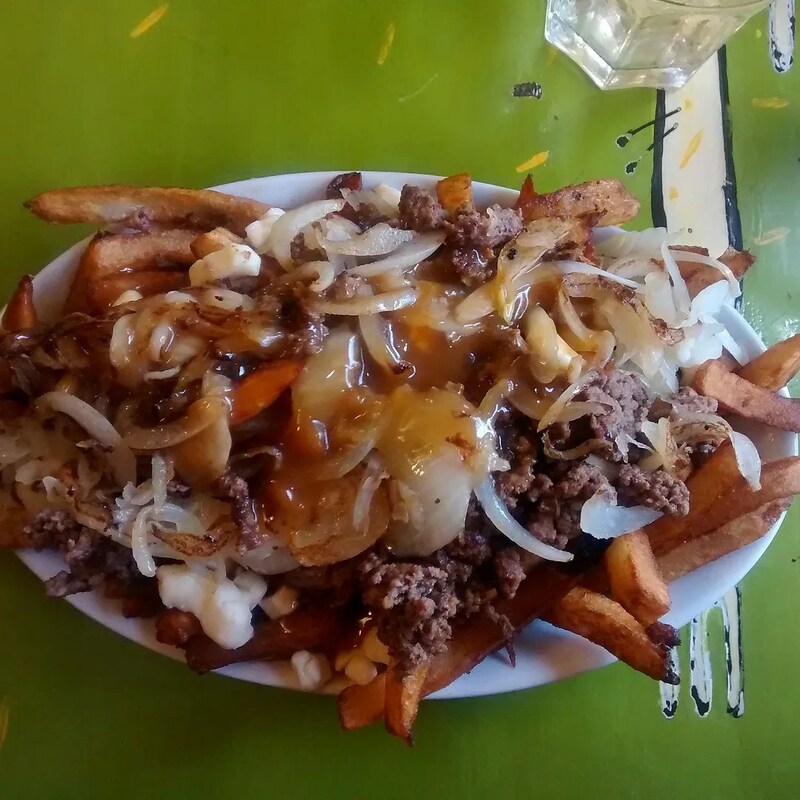 And, I as promised, I had the poutine I’d dreamed of. It may be a heart attack on a plate, but it was heavenly. Is poutine like pizza? Even when it’s bad it’s good? 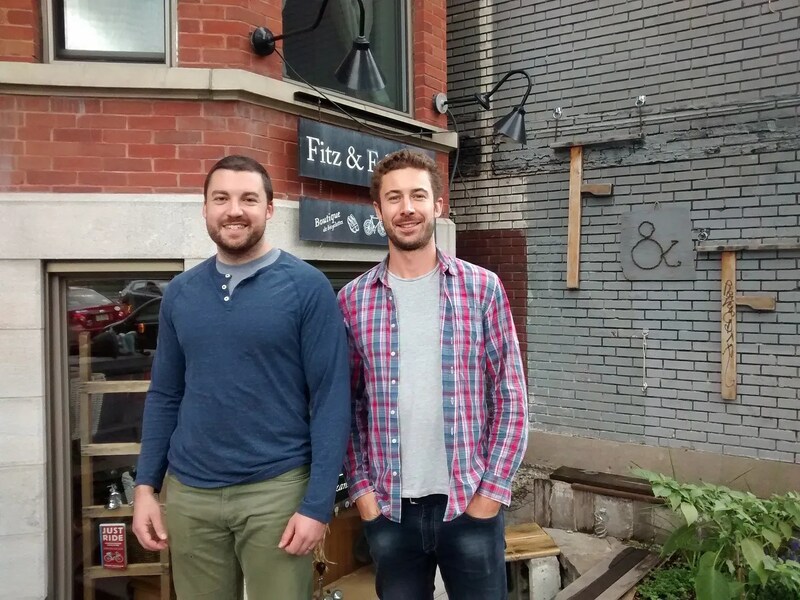 We wrapped up Montreal with two little sewing meet up. The first, below, was right after my bike tour which explains my cycle dress and thin film of sweat. Veronik, Alexandra, Heather and Vicki all came out. Some asides that show how weirdly connected you can be. Veronik is a knitwear designer. I don’t really knit (yet) so her name didn’t immediately ring a bell. Until I went on my Ravelry yesterday and saw that one of my two actual projects was hers!! It’s a hand knit sweater vest from Interweave back in 2007. I had a serious knitting friend back then and bought all the supplies to make it and never did. Alexandra and I met at PR Weekend Montreal five years ago. Since then, she’s had babies! How is it that people grow people when you’re still trying to remember to get dressed in the morning? Heather, everyone knows. I have the Ginger jeans pattern all printed, traced and ready to muslin. But, more importantly, she knew way more about US politics that I about Canadian. Thankful, because political chatter kept Jordan entertained longer than I would have expected. Vicki and Heather both saw Prince the week after he performed in Baltimore. We relived our middle and high school years talking about that show. After a few hours of wine and chatter, Heather offered to make dinner for all of us. So, pressure cooker + friends and it was an instant dinner party! And instant dinner party in which Jordan listened to four hours of sewing and I had a ball. My second meet up was with Jill. She met Jordan and I at a bakery in her neighborhood and we at ALL THE BREAD. No more Costco croissants. I swear they bake bread with a sprinkle of crack in Montreal. From Montreal we went on to Ottawa. 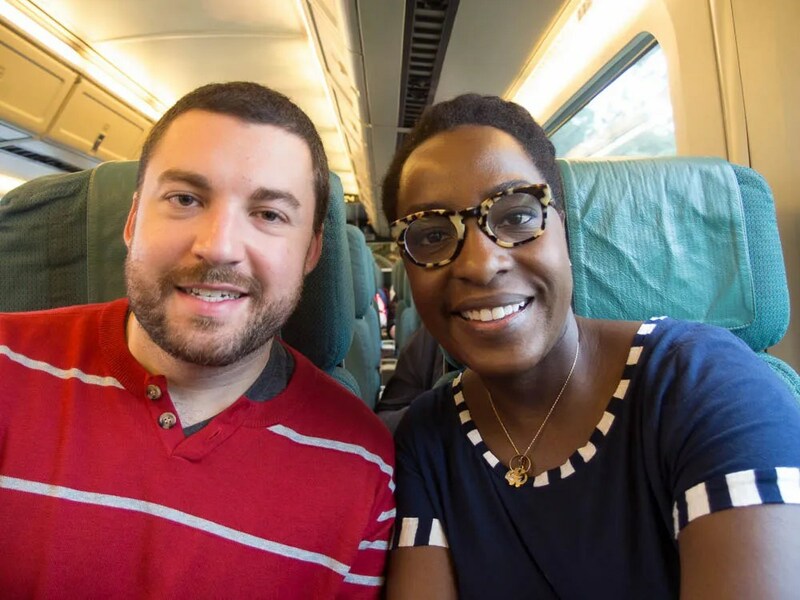 We took VIA Rail from Montreal (selfie stick represent). Is the train ever not elegant? 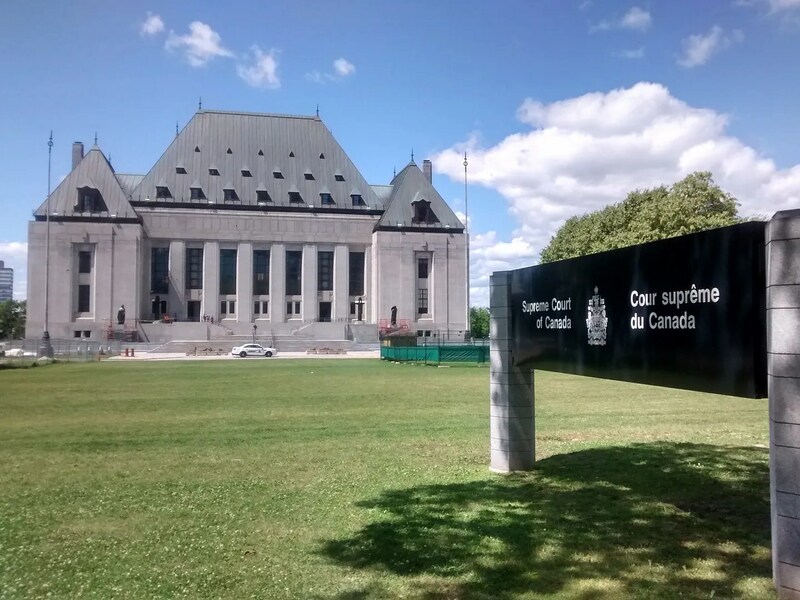 While we were rained out for Canada Day we still managed tours of the gorgeous art deco Canadian Supreme Court (obviously not my idea), walking the grounds of Parliament Hill, exploring Chinatown and taking a Thai cooking class at the Ottawa Chinese Cooking School. PLUS!!!! We had a lovely pizza dinner with the Sewing Lawyer Kay and her husband. We ditched Jordan at a bar and went to her house and checked out her Passap and knitting machine collection (no photos. I have no photos of this. How do I have NO PHOTOS??) I felt so good leaving her because despite both owning multiple knitting machines, we both have regular online searches going for new ones. These things seem to breed like rabbits itellyouwhat. And, now, I am back in town. Jordan started his firm job last week. Hello 12 hour work days and billable hours. What a change from two years of clerking! We had company over the weekend (which meant I spent all week cleaning) and more company this week when Jordan gets sworn into the Federal Bar. Exciting times. I do have new tunic top to show you (previewed on Instagram) and an update on Machine Knitting Lesson 2 from Saturday. Montreal Bound. Let’s Have Drinks. We’re getting ready to leave for Montreal via Amtrak. And, by getting ready I mean trying to sew a new tee shirt to take with me, doing laundry, waxing my eyebrows and generally going crazy. Jordan on the other hand had decided he’s staying up all night and not stressed. I thought a train through the US into Canada would be so romantic and continental. 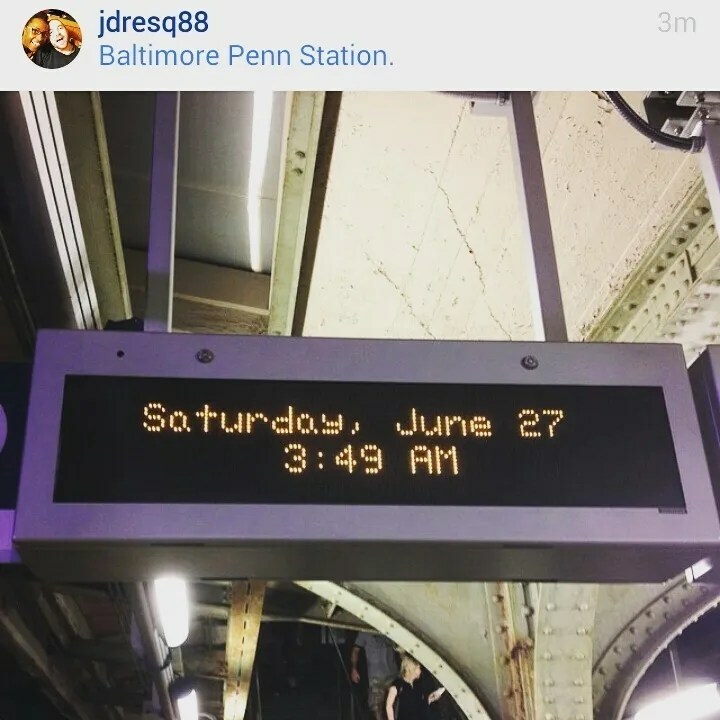 Except, our train out of Baltimore departs at 4 am. So, I’m just feeling tired and very American. 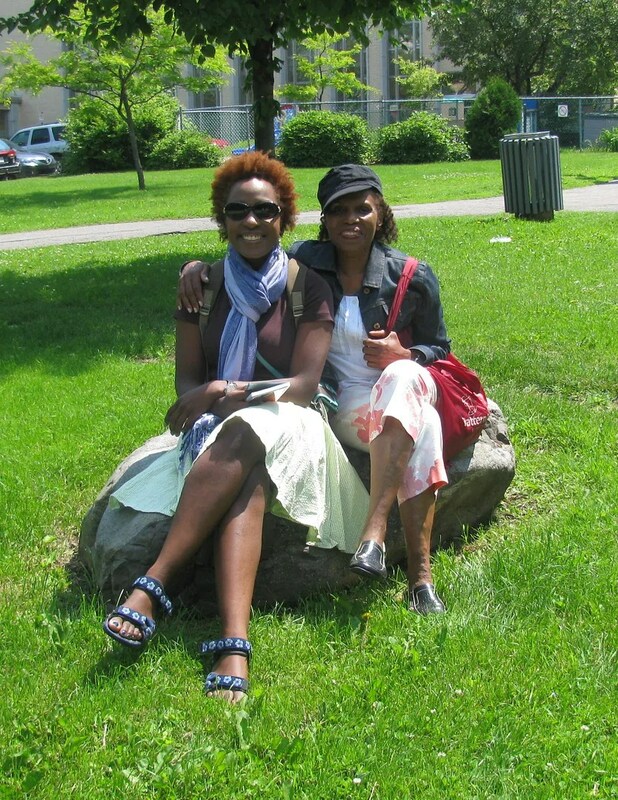 I was last in Montreal in 2010 with my mom, Aunt Judy and Trena for PR Weekend. It was like a family vacation. My mom was always game for a trip. Also, looking through my photos from last time, I think I actually sewed most of my fabric from the trip!!! And by most I mean some. Don’t judge. So, if you’re in Montreal and interested in getting cocktails Monday the 29th, leave a message here or send me an email. I’ve poked and prodded Vicki (Another Sewing Scientist) and Heather (Closet Case Files) to take me out. 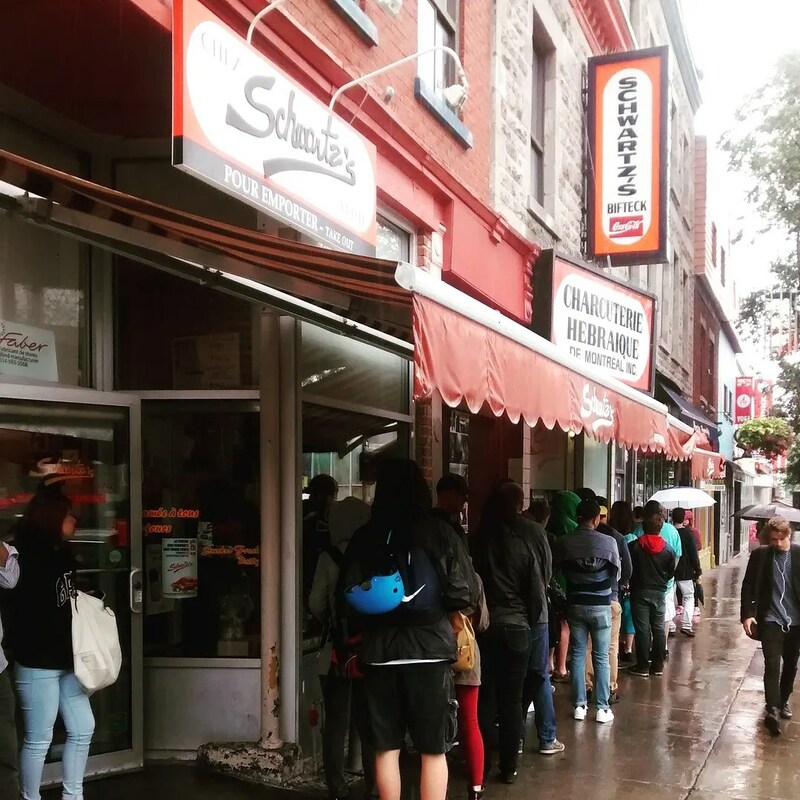 I think the plan is have a little somethin’ somethin’ at Huis Clos on St. Denis. I’m not sure of the time, but likely after work hours. Finally, Here’s a list of all the things I will eat next week. We are back from beautiful, warm and gracious San Antonio, Texas! My parents lived in the San Antonio area (Garden Ridge) some 15 years ago and I remember visiting them many times. But, somehow, I never got a real feel for the area. After spending the long holiday weekend there, I can tell you I love it. First, it was warm an sunny our first day. Second, I can’t remember the last American city I’ve been to that had so much diversity. We kept remarking at different sites at how many times we saw people of different ethnicities socializing together. There was such great American history and culture in San Antonio. 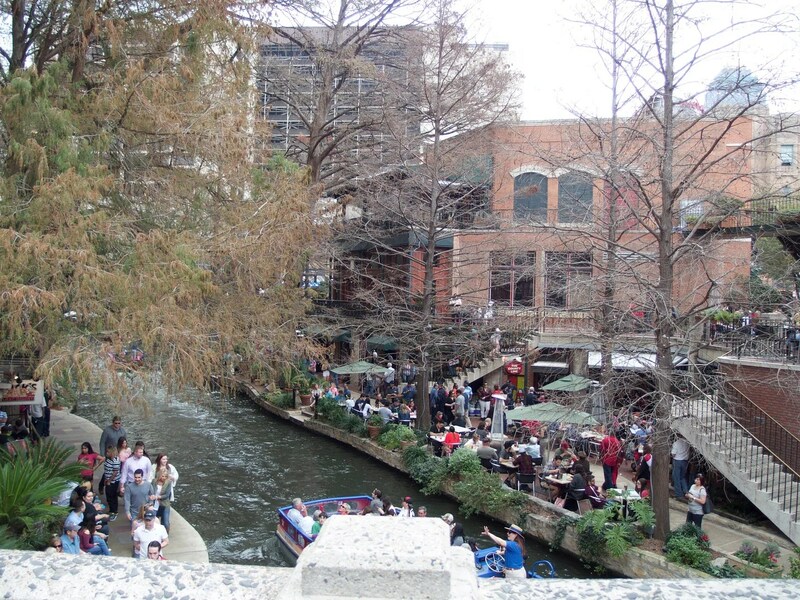 We stayed at a fantastic inn in the King William / Southtown neighborhood and were walking distance from the Riverwalk and all the major attractions. 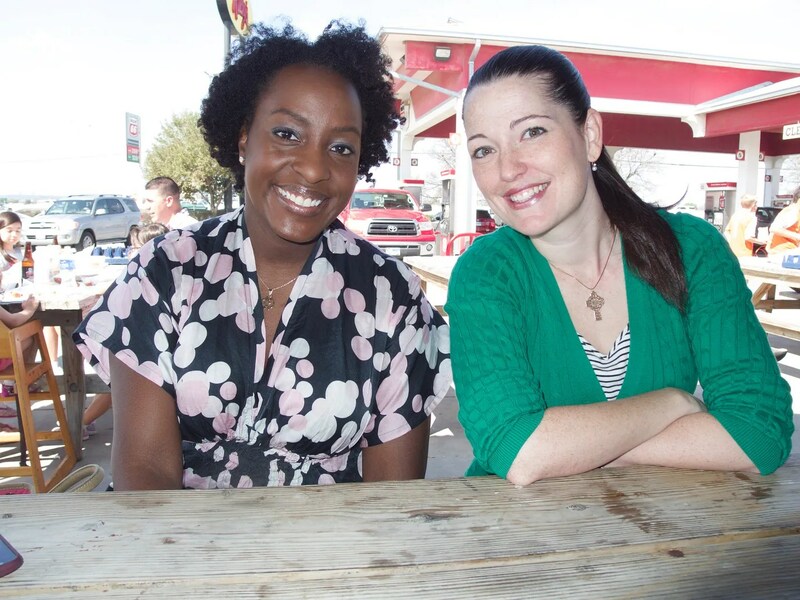 But, my biggest personal draw to San Antonio was the chance to meet Amanda from Amanda’s Sewing Adventures. 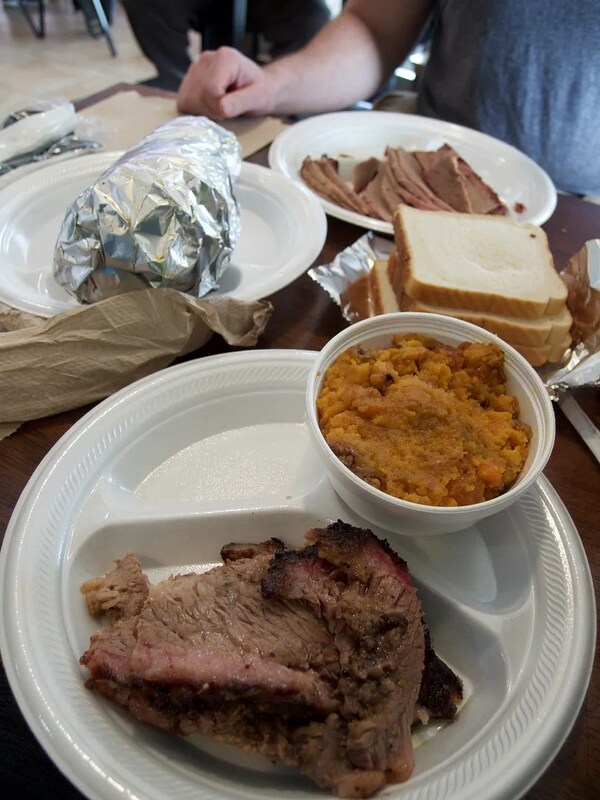 She was kind enough to introduce us to real Texas BBQ on our first full day in town. I say ‘introduce’ because there really was a lot to learn 🙂 Like, did you know brisket can come ‘wet’? Until this trip, I thought brisket was boring and I didn’t know what the big deal was. 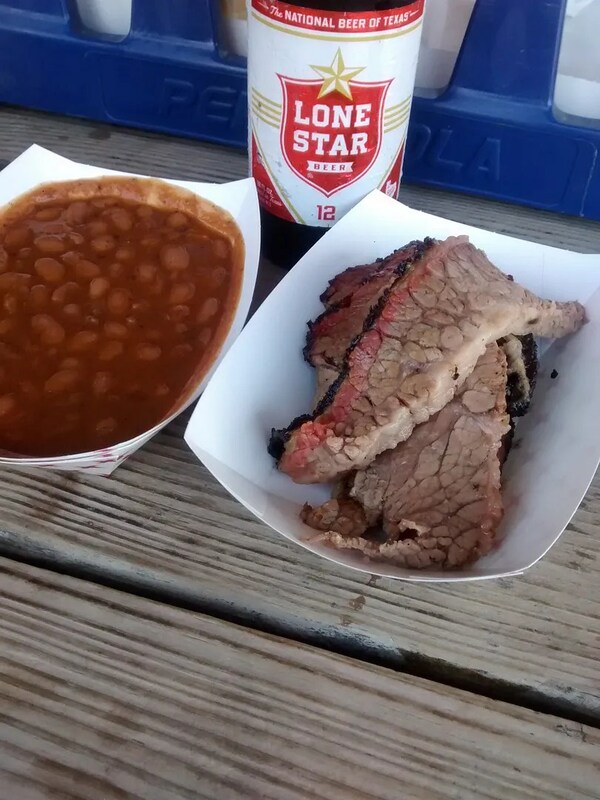 After this trip, brisket is my jam. 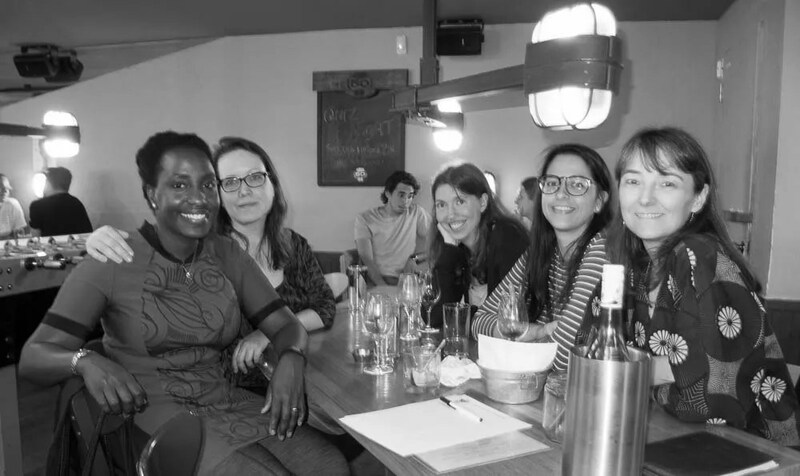 Also, from now on, I might try and meet sewing bloggers over local food instead of fabric. 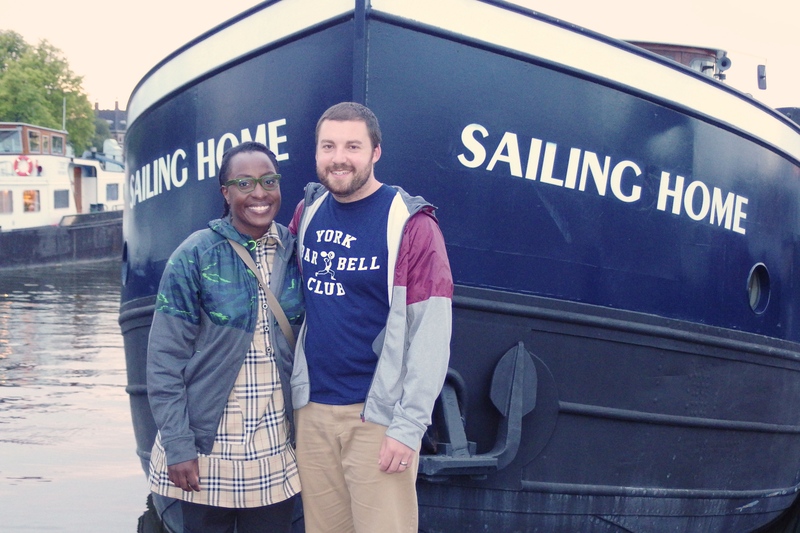 It’s possible I plan trips around what other sewing bloggers I can meet. If I’m being honest, when we start talking about places to go, I do run through a mental list of ‘Who do I know…’ Sadly, Amanda didn’t bring her recent pink coat so I could take it back to Baltimore with me. We got rained out of our bike tour of the city and missions on our second day. So, we made up for it by going back out for more BBQ. The Big Bib opened at noon and I kid you not, there was a line 30 people deep when they opened the door. My dad was also in San Antonio for the weekend and we got to spend a little time with him before heading back home. It’s good to see him smiling again. 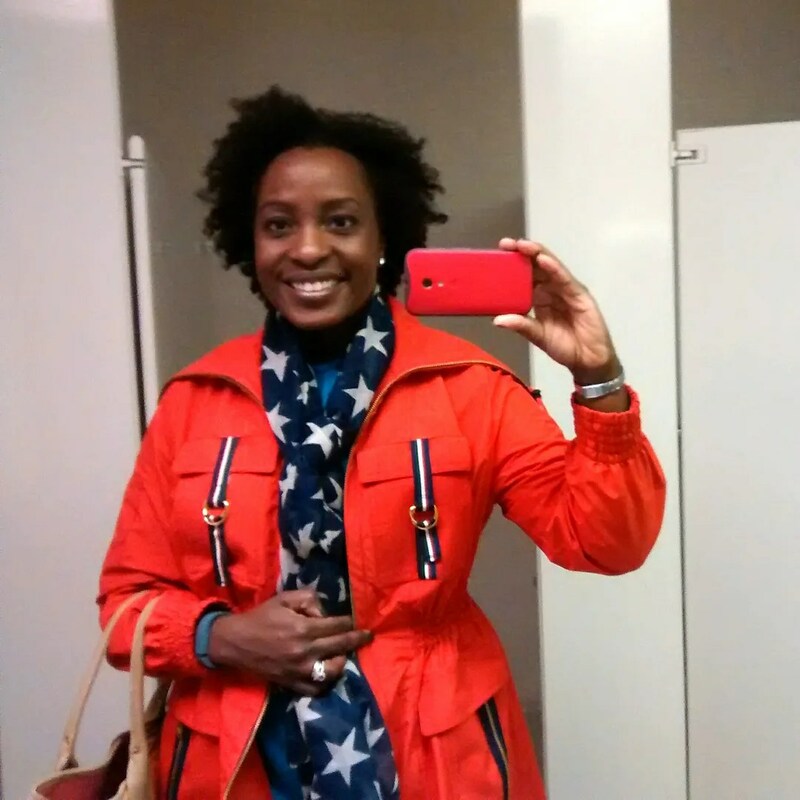 I naturally took the opportunity of being in Texas to dress like an American Flag. My last funny about TX is I reserved a hybrid or sub-compact car while we were in San Antonio. When we arrived, they gave us a Toyota 4Runner as it was the smallest car they had available. I guess everything really is bigger in Texas. But, for real. From now own, President’s Day weekend gets spent in a warmer climate. We came back home to 8 degrees (-13 in Celsius) and snow. I also really like that in the last year I’ve done more traveling in the continental US. Growing up an Army brat we were always taking trips overseas. But, I’ve really come to appreciate all the great places there are in the States you can visit. Now that I’ve got some of the sewing related stuff out. Here’s a final post on how the rest of the trip went. 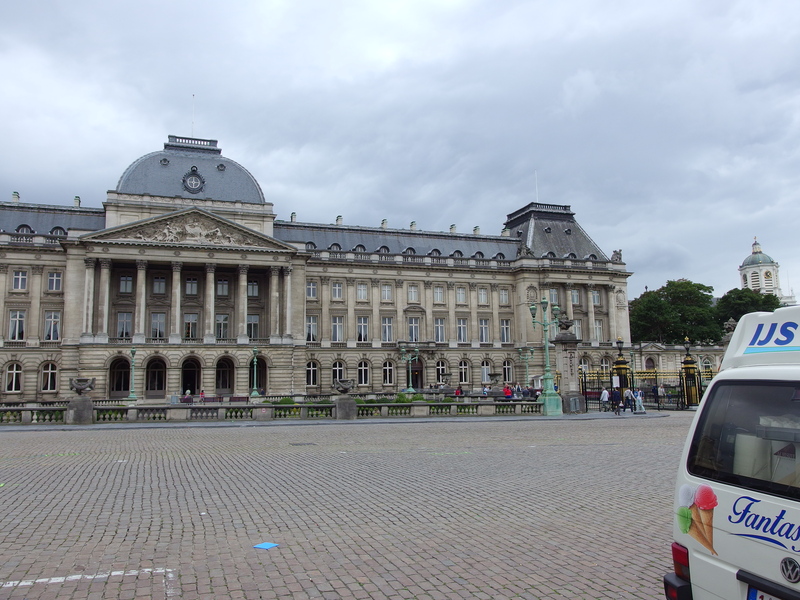 Before we started the bike and barge portion, we spent a day on a bike tour in Brussels. 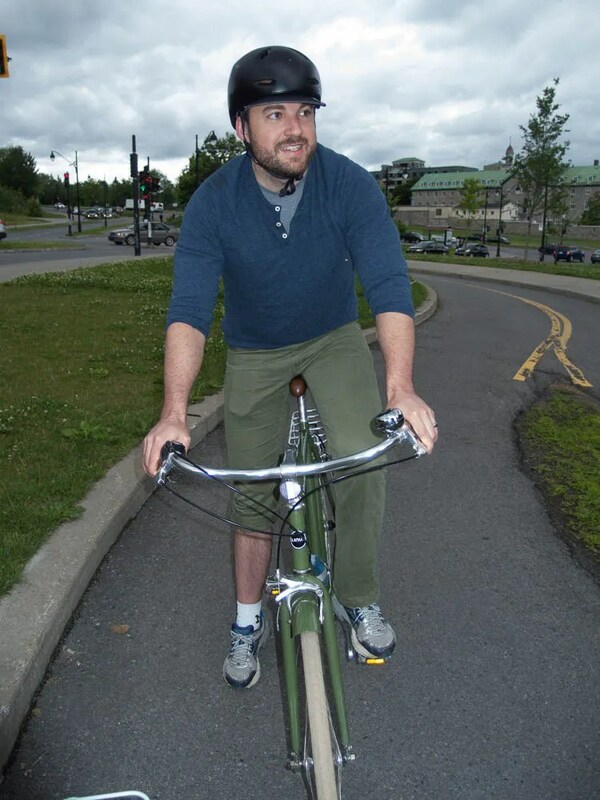 I’ve done bicycle tours in Minneapolis, Montreal and Shanghai. They really are a great way to cover a ton of ground and get an overview of the city. The Royal Palace was open for about three weeks for tours for the year. But, we could not seem to get organized around things shutting down around 4 p.m. Thus, I missed my chance to tour the palace. A theme which continued on in the Netherlands. The Liege waffle might be the best thing I’ve ever eaten. I’ll also just tell you now. 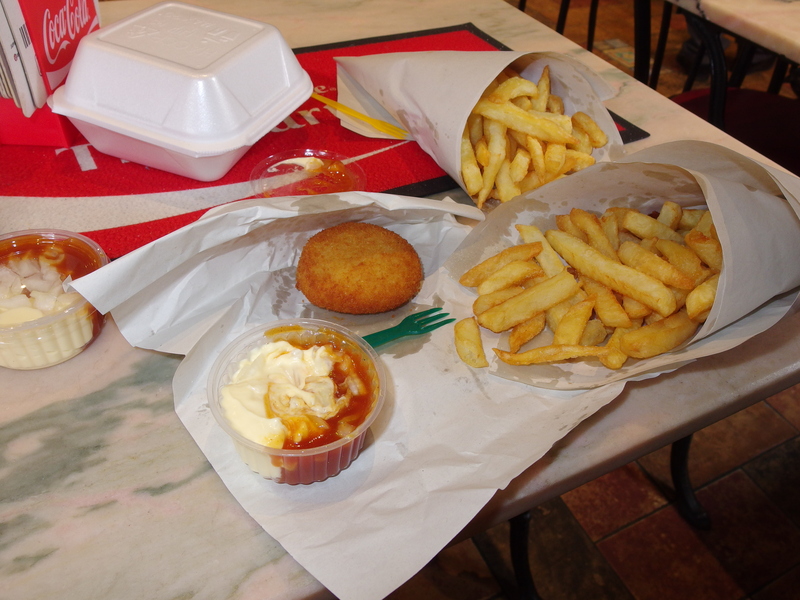 We had a lot of frites. I’m not that in to chocolate. I don’t think we even bought any on this trip. But, I ate waffles and fries like they were being discontinued. They say the Liege waffle has sugar in the middle. I decided it’s not sugar. It’s crack inside of them. They were that additive. 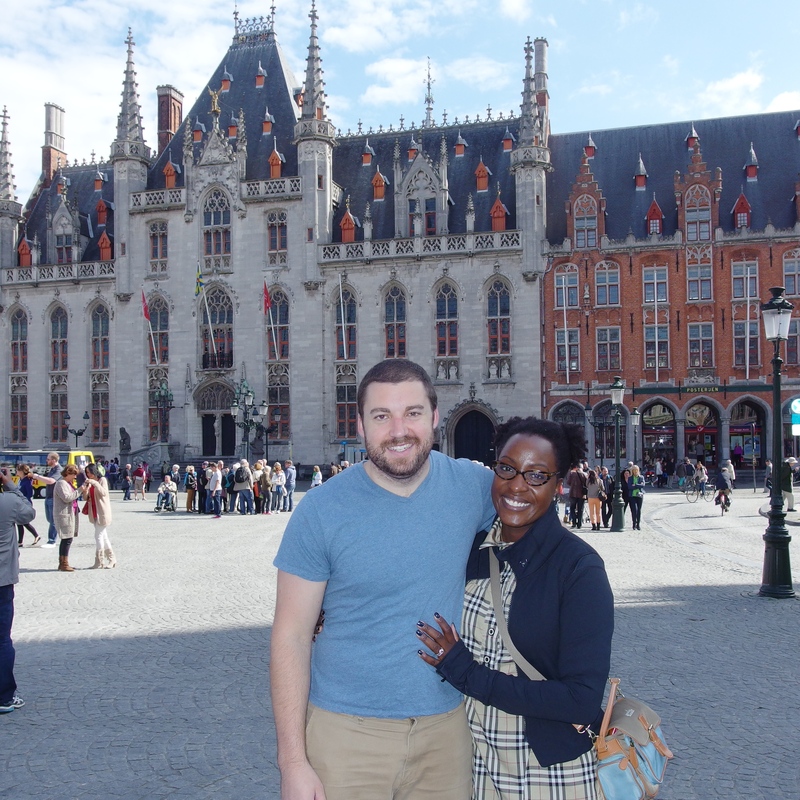 After a day in Brussels, we headed to Bruges. It’s SO BEAUTIFUL. 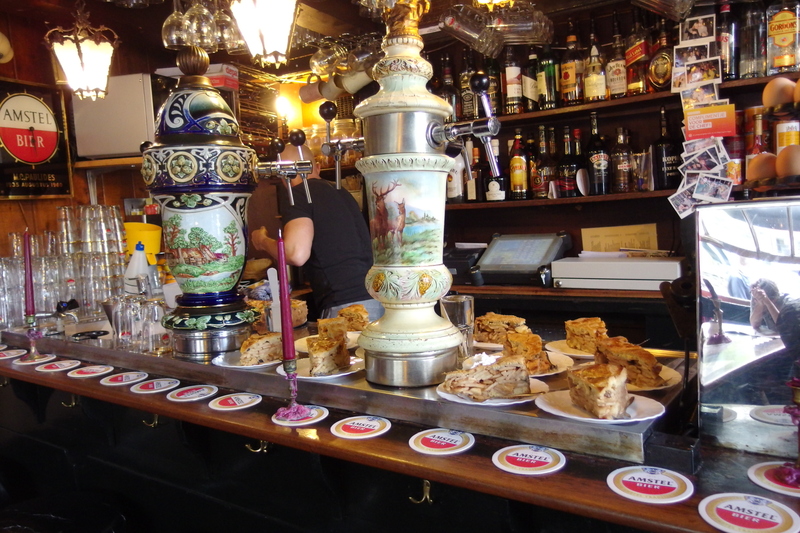 All I really knew about Bruges was from the movie, In Bruges. Guess what? There’s a Bernina store there! If you think the prices are high for Berninas here, the feet there would cost me 30 percent more because of the exchange rate. Ouch. Right-o. The bike trip began in Bruges. Our barge would sail during the day while we biked and we’d get back on board in the evening. The crew was great and the food was awesome. The biking was fun! I wasn’t at all prepared for it training wise, but you didn’t really need to be. That said, it was a lot harder for me now than three years ago. Jordan on the other hand thought it was easy peasy. We saw castles and windmills and ate lots of cheese. We also visited a working dairy farm and bought more cheese than a cardiologist would approve of. When we got on board our guide immediately knew our names. I asked how he knew it was us. And he said, ‘Easy. You’re the youngest people on the tour.’ Isn’t that awesome? The next person in age to me was 20 years older and they rode hard. Do you see why I can’t moan about being out of shape?? This guy below is from Australia. He’s 75. 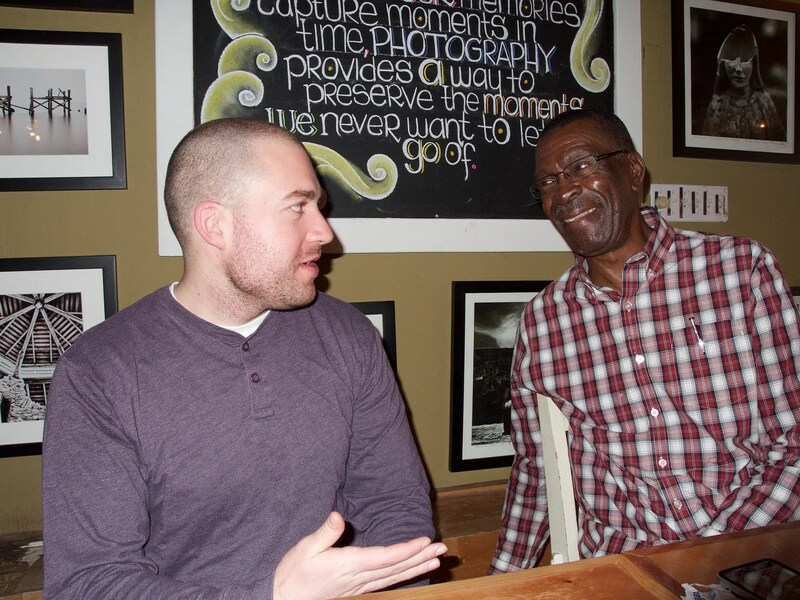 Jordan is the same age as his oldest grandson. And, he kicked our butts going up hills. He’s got the legs of a 35 year old. He’s in a bike club in Australia and has two hip replacements.. He was awesome. I tried to hook him up with Jordan’s grandmother but I suspect the distance between Melbourne and Maryland is too far. 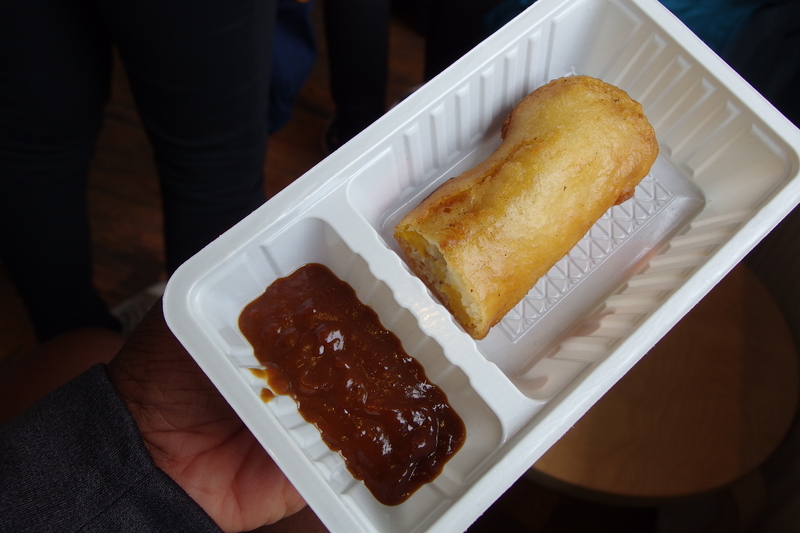 Our first day in Amsterdam we took a really fun food tour of Jordaan, the neighborhood we were staying in. 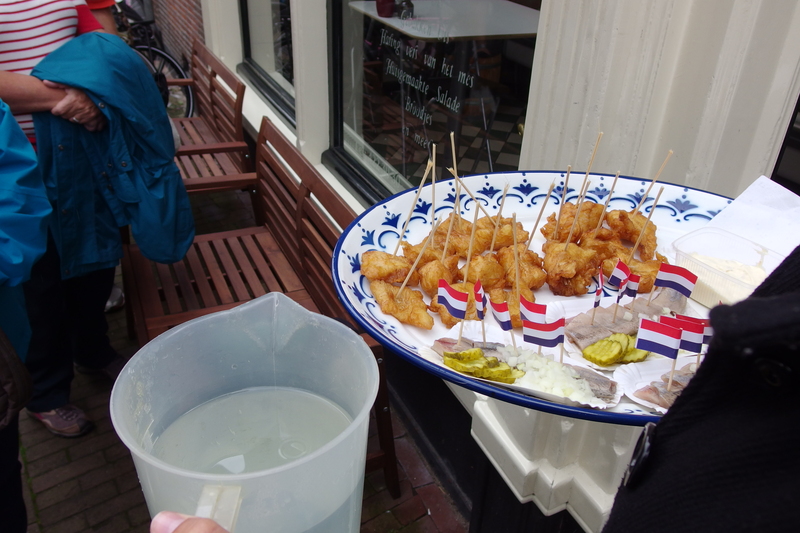 We sampled all kinds of Dutch specialties including herring, Surinamese food, Dutch food (bitterballen), licorice, and Dutch apple pie. 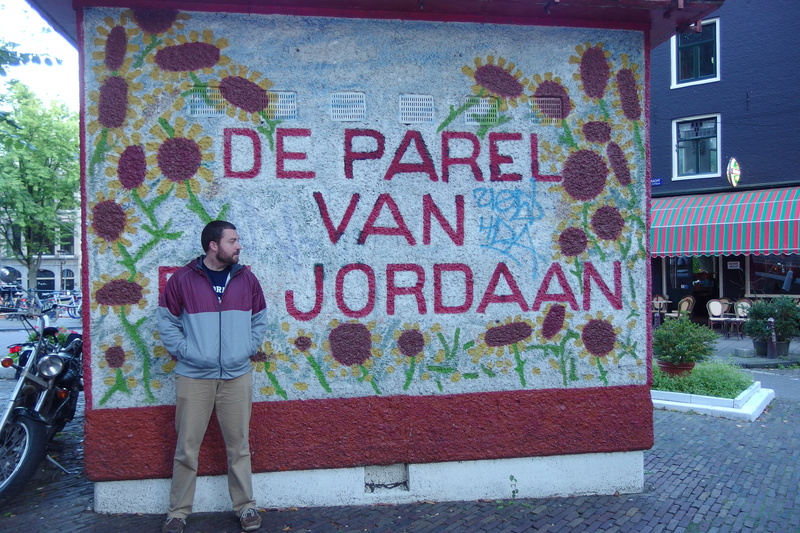 Sunday we hit the Van Gogh Museum and the Jewish Quarter. 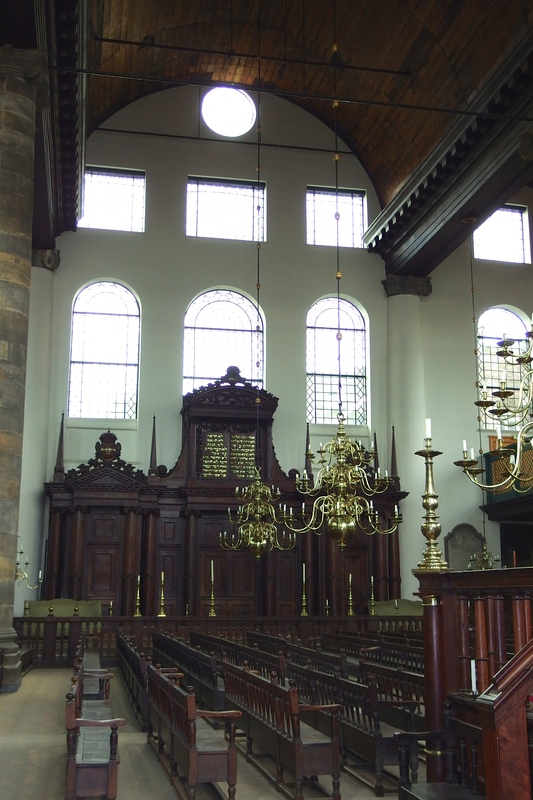 In the Jewish Quarter we stopped by the Portuguese Synagogue and the Jewish History Museum. We didn’t have enough time for my favorite museum, the Dutch Resistance Museum. 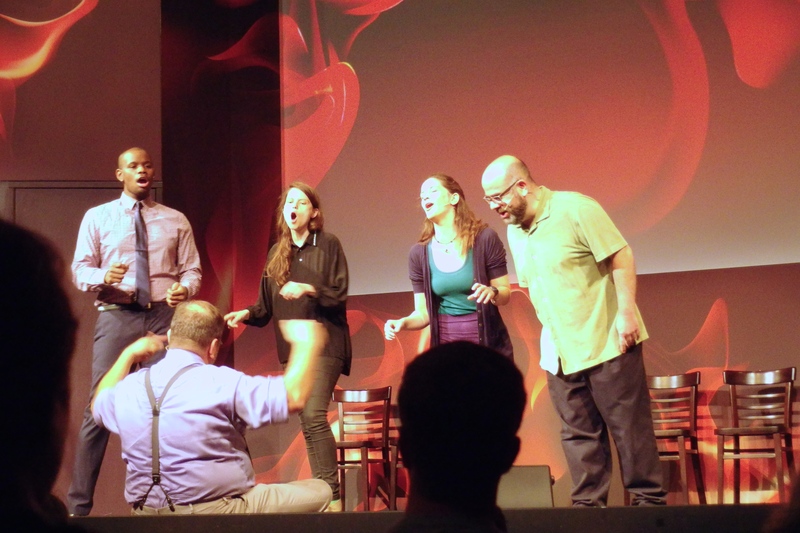 Sunday night we saw an English language improv show with all American actors at Boom Chicago. Isn’t that amazing? American comedy in Amsterdam. And, the place was full! When you walk around Amsterdam, you can see in almost everyone’s window. 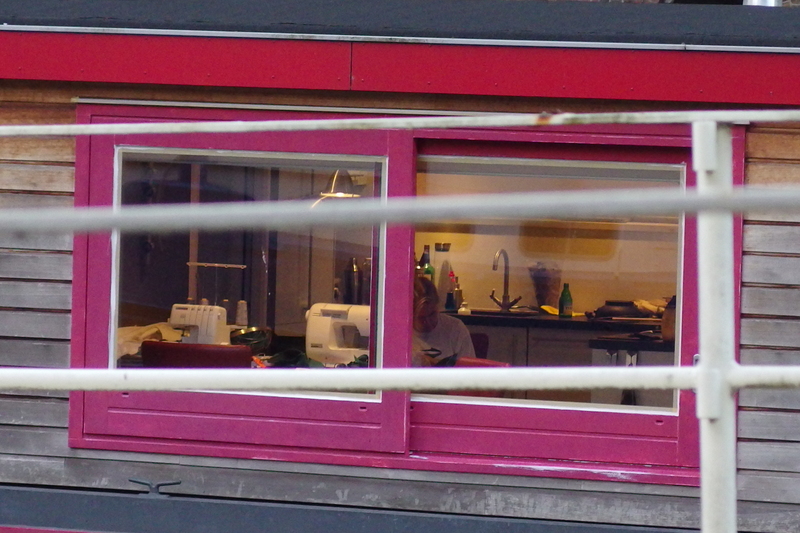 Imagine how tickled I was when I saw a dress form on a canal house boat and a woman working away on her sewing machine! 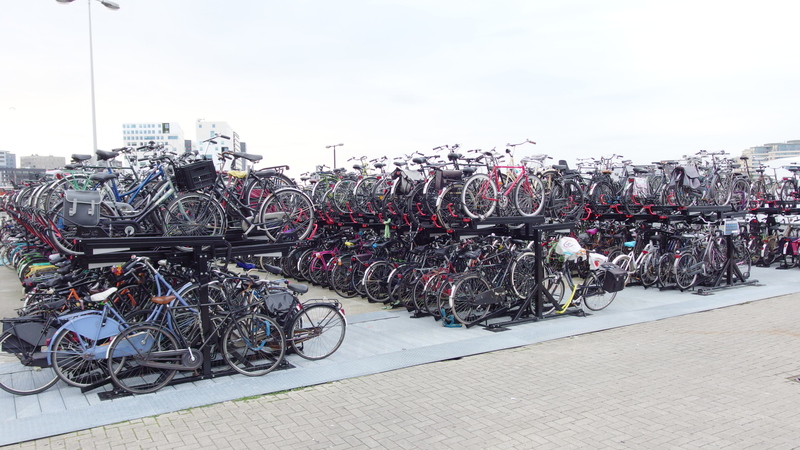 And of course, I still can’t get over ALL THE BICYCLES. It was a tremendous vacation. We chose our honeymoon in the middle of what I can only describe as the most surreal time of my life. Traveling, especially in Europe, reminds me of my mom in all the best ways. She always took us on trips and suggested places to go. Traveling was really her passion. This trip felt like closing the chapter on an emotionally complicated period and opening a door to the next phase. The last year I’ve literally felt like the walking wounded. I didn’t realize just how much was weighing on me. I knew I was sad. I didn’t know I was crippled. I am honestly starting to feel like me again. So much of our trip’s success relied on the kindness of Internet friends! First, sweet Katherine in Brussels offered to let us stay at her home outside of Brussels for a few nights before we headed in to Bruges to start our trip. Imagine our car-centric surprise when she arrived with a bicycle and two adorable children to carry our luggage to her house! ** Jordan’s not in the Army. But, he’s using my mom’s old US Army duffle which I used to use to travel all over the world. After this trip, we are so not going to travel with it overseas. Oy. Can I tell you that these kids are the greatest?!? Like Linus, they liked Jordan better than me. He managed to do two different arts and crafts projects with them at the same time. Katherine and I were busy talking sewing machines. Also, when you speak to these cuties in English, they respond in French. IT WAS SO STINKING CUTE. We’d say, ‘I don’t speak French. Anglais? Anglais?’ and they’d look at us like we were simpletons, sigh politely and and say like three words in English. Their mom speaks to them in English, but she understands their French when they respond. You know how they say ‘Hello, Kitty’? ‘Hallo Keeety!” I wanted to die of cute overload. Katherine also took some time to show me how to make vegetarian dolsot bibimbap from Korea. Mmmmm. We’ve been talking about this for years! 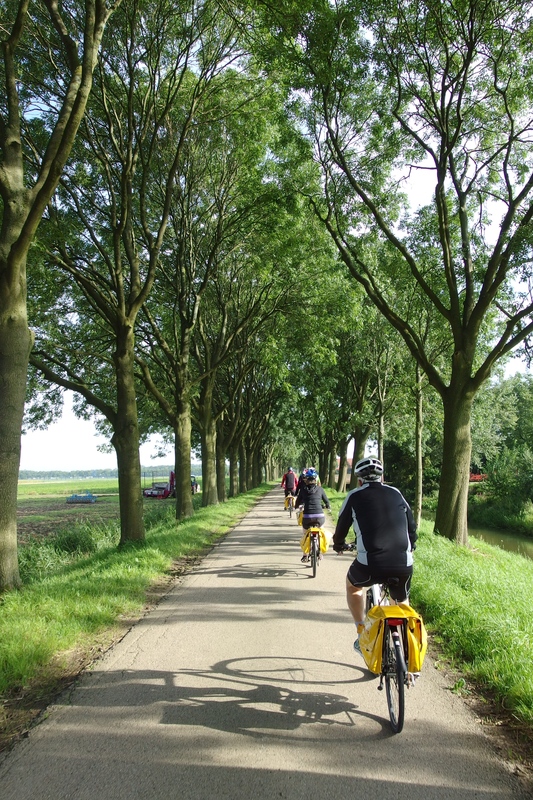 From Katherine’s, we headed to Bruges to start our week of biking and barging from Belgium into Holland. At some point I may get myself together to actually talk about the non sewing related parts of the trip! After our week of biking, our clothes were so so terribly smelly. And, being American, we expected the laundromat in Amsterdam to be open all night long. Not only did the laundromat by our rented flat in close at 3:00 pm on Saturday, it wasn’t even open on Sunday. Jordan was literally out of clothes (I was washing mine as we went along. He… wasn’t). I emailed Valerie who lived in the neighborhood for suggestions of other places to try. Since we were staying in her neighborhood, she cheerfully suggested we do it at her house. First, she saved us like 25 Euros. 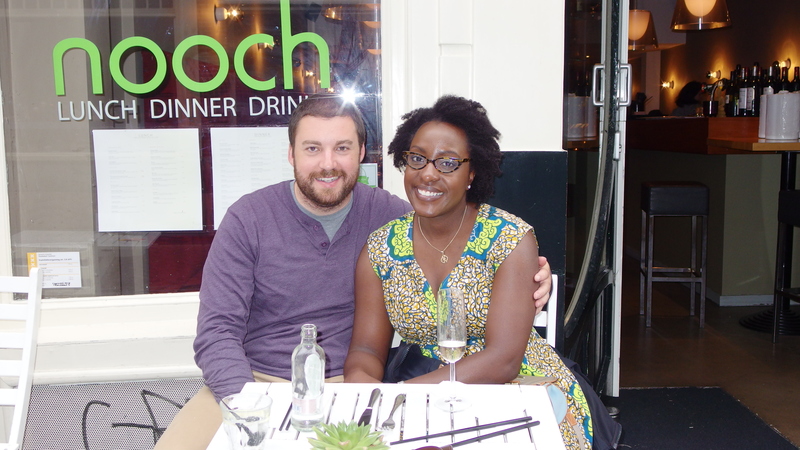 But, second, we got to drink wine while the laundry was running and talk to she and her husband all about Amsterdam, the neighborhood, the politics of the city and country. We’re policy geeks so loved getting to hear the un PC version of what was going on in Holland. The next day, she also escorted us to meet up with Hilde (on the left and Valerie on the right) and tour the Monday fabric market in Amsterdam. Did you hear that? OUT DOOR FABRIC MARKET. Hilde came bearing gifts: A men’s issue of Knip Mode and some beautiful lace in her stash for lingerie sewing! (I thought I took a photo…) Do you see Jordan stretching a little to improve his height? He spent a lot of trip noting women he could look in the eye and men he had to look up to. The Dutch are tall! After touching all the fabric at the market (and buying something I didn’t take a photo of), Hilde came along with us to Rotterdam where Marta was there to give us an insiders tour. Rotterdam is a Baltimore’s Sister City. But, the city is also known for it’s modern architecture and I thought Jordan would get a kick out of it. Can you believe Marta took time off work to show us around?? Marta was an excellent guide. She showed us all her favorite spots and sites that Rotterdam is known for. I think Jordan’s finally gotten used to meeting my ‘internet friends’ when we travel. I’m just really glad we had enough time and people were so generous with theirs! 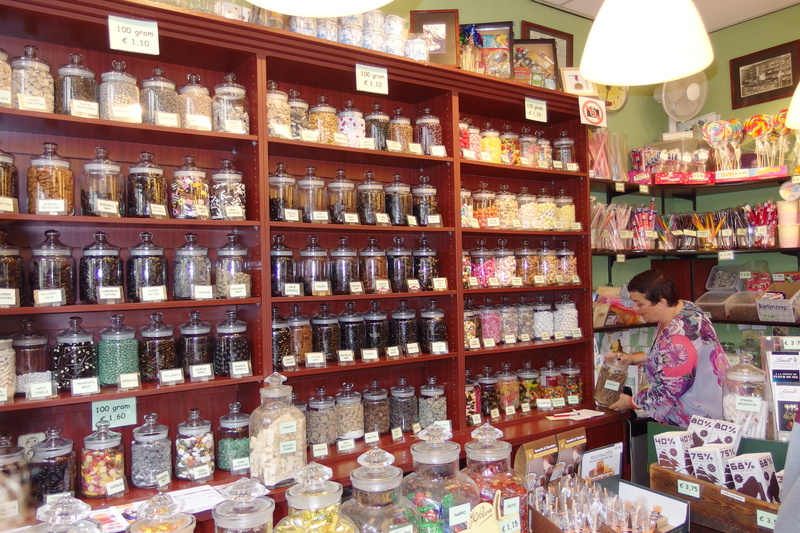 To be honest, I totally added an extra day to our trip just to make sure I could get my fix.